The Timbisha Shoshone Indians were devastated to learn that pioneers misunderstood their homeland enough to name it "Death Valley." To the people who lived in the area for more than a millennium, the valley's resources offered everything necessary for comfort and contentment. Traditional brush homes made perfect desert dwellings, allowing breezes to filter in through the arrowweed walls. Men hunted jackrabbits and bighorn sheep, using arrows tipped with stone points. Women wove baskets so intricately coiled they could hold water. These were sometimes decorated with patterns of interlocking shapes or a delicate geometry of lizards and butterflies. The Timbisha's oral history relates that they have lived in the area since time immemorial -- and, many visitors are surprised to learn, still live in the heart of Death Valley today. To fully understand the valley in all its vast dimensions, it is essential to be aware of of this deep connection between the natural landscape and Timbisha Shoshone culture. Mesquite trees were always a focal point of Timbisha culture. Tribal members would help to care for the trees through spring, monitoring the new growth of leaves. When ripe pods were ready to be gathered during the late spring, the harvesters would also take time to clear away dead branches from each tree. The Timbisha then collected the fallen mesquite pods, grinding them into a sweet flour and shaping it into cakes to take with them into the mountains when the valley floor grew too hot. These cakes provided food throughout the fall and winter, supplementing a diet of of game and roasted pinenuts. In this way, the mesquites were not just a food source, but part of the tribe's reciprocal relationship with the land -- the people cared for the trees just as the trees provided for them. When the long string of gold seekers, borax miners, and other desert explorers began to cross Death Valley after 1849, their Westward journeys forever altered the Timbisha Shoshone's traditional way of life. The ensuing story of disease, struggles for land, and harsh competition for resources is tragically familiar in early American history. When mining companies began digging in the valley, they obtained legal rights to many important water sources that the Timbisha had used for centuries. Soon the Pacific Borax Company began extracting minerals from the Furnace Creek area, forcing the tribe to move from their traditional camping area, and relocating them several times to less desirable sites. 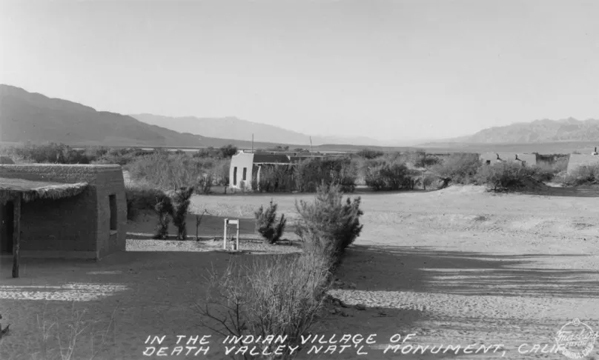 Death Valley became a national monument in 1933, presenting additional challenges for the Timbisha. Already exploited by the mining company, many tribal members viewed the National Park Service as simply the newest wave of intruders. Tensions between the park and tribe surged as federal policies shifted from decade to decade. After the tribe was uprooted for the last time in 1936, settling into the current Timbisha Indian Village at Furnace Creek, an early superintendant arranged for the CCC to build adobe homes for native families. A less progressive administration in the 1960s ordered these same homes washed away with high power fire hoses as part of a policy to evict tribal members from the park. Throughout these difficult years, the tribe ardently remained in their village despite the legally ambiguous situation. As Pauline Esteves, Timbisha elder and former Tribal Council Chairperson, eloquently wrote: "The Timbisha people have lived in our homeland forever and we will live here forever. We were taught that we don't end. We are part of our homeland and it is part of us. We are people of the land. We don't break away from what is part of us." Esteves wrote those words as the preface to the Timbisha Homeland Act, which Congress finally passed in 2000 to establish a 7000-acre land base for the tribe within its ancestral homelands. Three hundred acres of this homeland lie within Death Valley National Park, including the Timbisha Indian Village. Today, the tribe and park service are working cooperatively on several projects, but threads of frustration and pain connect many tribal members to memories of harsh treatment in the past. Even after accomplishing the vital step of securing a land base, the Timbisha continue to struggle with the fact that there are few prospects of economic development in such a remote area. Despite this challenge, the tribe is now constructing a community center and working on several projects to help reinvigorate their cultural traditions. One of the most important of these is the Mesquite Traditional Use Pilot Project. The local mesquite population has been struggling ever since settlers diverted much of the water for domestic use and irrigation of foreign date palms and tamarisk tree, leaving less behind for the native trees. As the area developed, even more water was used to support the growing number of valley inhabitants and tourists. In this fierce competition for water, the tamarisk tree -- commonly called the salt cedar -- has invaded the mesquite groves, caused many of the mesquites to become unhealthy, unable to produce pods or spawn new trees. This deterioration profoundly concerns the modern Timbisha, who take great pride in continuing the mesquite harvesting traditions of their ancestors. Tribal members express deep distress that "there are no new mesquite trees growing, only old trees dying." To address -- and ideally help reverse -- the mesquites' declining health, the tribe recently launched the Mesquite Traditional Use Pilot Project, The study will focus on two half acre plots of mesquite in the Furnace Creek area. Situated on land that is said to produce the sweetest pods in the area. Situated on land that is co-managed by the Timbisha and National Park Service, the grove's water levels and evaporation rates are now carefully monitored. The Timbisha hope that by practicing traditional care for the mesquites, the maintained section of the trees will be restored to a healthy state. The tribe and park service have also collaborated to remove the invasive tamarisk trees in the area, leaving only the mesquite trees in most sections of the Furnace Creek grove. It is hoped that in the absense of the foreign tamarisk trees, the mesquites will not have to compete do fiercely for land and water, healing their root systems and encouraging new growth. 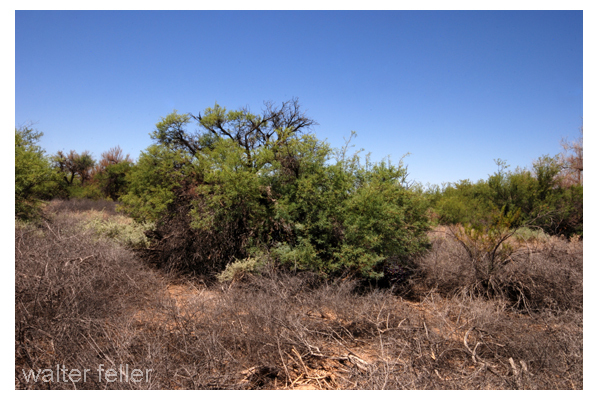 In many ways, the mesquite trees and the Timbisha Shoshone tribe share a similar story. Both have lived in the valley for centuries, their balanced lifestyles disrupted by the coming of foreign inhabitants who crowded their land and took the water that had always been theirs. Both native trees and native people endured pressure from newcomers that tried to dominate the area, but both survived the difficult conditions until a time when their importance was again understood. And now, with restored land of their own to grow and the revival of traditional ways, both the Timbisha Shoshone and their mesquite trees will find a way to thrive again in this changed world.